It’s been just over a year since I’ve seen EmSpace Dance and detour dance together on a shared program. That night, in December of 2015, each company offered a new world premiere. It was a divine evening of compositional innovation, inspired performances, penetrating thematics and some serious fun. So, to see these two companies together again was certainly an exciting proposition. And what a performance! For this engagement, the pair teamed up as part of Shotgun Players’ BLAST Theatre Festival, each bringing a revival of recent work: EmSpace Dance’s Monkey Gone to Heaven (redux) and detour dance’s FILAMENTS. Now a shared program certainly does not mean that the pieces must share a common thread. And yet, I was struck by a connective fiber – a compositional form simultaneously experimenting with deconstructed conceptual narratives and scene-based throughlines. Each work was navigating structural styles, deliciously teetering between dance theater and the dance play. 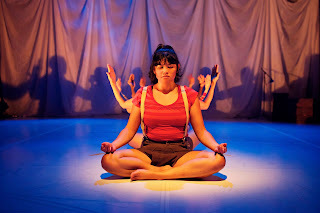 As they took the space for Monkey Gone to Heaven (redux), conceived and directed by Erin Mei-Ling Stuart, the seven performers sat in a line, six of them facing upstage. Using their heads, arms and hands, they cycled through a series of meditative motions, sometimes in unison and sometimes in a wave. The remaining cast member faced the audience, and a monologue unfolded – one about connecting with a gorilla at a zoo. But it wasn’t just about logistics; this was a devotional story, a recounting of a spiritual experience between two beings. In this first vignette, Monkey Gone to Heaven (redux) introduced a set of bonds: between a community of individuals; between humans and animals; and between the physical realm and the sacred realm. Over the next forty minutes, these themes would play out and be unpacked through a beautifully crafted theatrical collage. Movement, storytelling, song, instrumentals and humor exploring the interconnectedness of human, animal and spiritual spheres. Primate and contemporary release language joined together in physical phrase material - arms swung, legs hovered in deep plié, fingers curled, bodies bounced. Stories about famous animals were shared with a subtle religious framing (the storyteller referring to them as ‘patron apes’). Rituals and prayer informed the action on stage. Cast members conversed with the audience. A soliloquy/interview about the loss of a tail was shadowed by a vulnerable and tactile pas de deux. And all of these parts were expertly woven together to speak broadly about connection. Connections that we seek after, participate in, but don’t fully understand. Mysterious connections where there is a belief and fascination in what we cannot see. Connections that happen spontaneously, with no planning or intention. And the space between scientific reality and the human condition of ‘what if’. 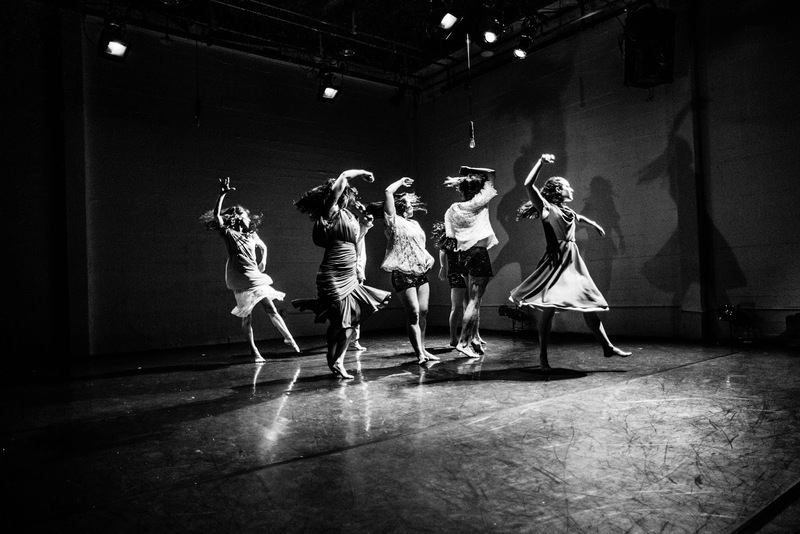 detour dance’s FILAMENTS, directed by Kat Cole and Eric Garcia, actually began during intermission, while the house lights were still up and the audience was milling about. One by one, dancers entered the space and engaged in a stylistic, Fosse-esque jazz phrase. A narrative was being established, even in this entr’acte of sorts. Who was watching? Who was paying attention? Then, as the blackout ushered the official start to the work, one dancer slowly walked across the stage and approached a light (amber bulbs that had been hung around the perimeter of the stage). Another cast member who had taken a seat in the audience began remarking about the beauty of this theatrical vision – a hilarious exchange ensued. This segued right into another comical scene. Five performers broke the fourth wall, engaging with the audience and repeating an emotive, purposely exaggerated choreographic excerpt, appropriately followed by drawn out bows and gracious thanks. Scenework, contemporary choreography, gestures, live music and props continued to converge in FILAMENTS, a study of observation, attention and the desire to be noticed. Through the lens of the theatrical world, its stereotypes and the personalities that inhabit it, Cole and Garcia were making a larger statement about roles, constructed containers, fantasy, reality and how each of those relates to our sense of self. One segment found the cast moving through a string of postures, almost like they were facing the mirror in a dance class, except we, the viewers had become their mirror. Influenced by the structure and conventions of center work, they posed, compared themselves to others and primped, concurrently poking fun at the conventions of class, while accurately reflecting the real behavior that exists in that environment. Another telling scene found two dancers wearing paper bags over their heads, moving with a realism and vulnerability that felt fueled by the fact that they couldn’t see each other. There was a clear freedom in their anonymity. As hinted at by the title and initiated in its first minutes, various images of light recurred in FILAMENTS. Performers stared at the lights and cradled them, suggesting a power, an authority. They were absolutely hypnotized by these lights, so much so that they completely unaware of the dynamic, highly physical solo underway around them. FILAMENTS’ complex diva character, who made numerous appearances, also had a revelatory relationship with light. One of her most stunning moments was a solo mid-way through the piece. As an evasive shinbuster spotlight moved about the stage, she tried to catch it (literally and figuratively), at first dancing with grace and elegance and in the end, desperately clawing at the floor, and at the need to be illuminated.